Play has started out fairly tight in the first two levels today. Even with the double bustout early in the second level, players seem to be playing cautiously. Perhaps the huge pay jump between busting early and a deep final table run is engrained in the minds of the players. Johnny "World" Hennigan has just scored a double knockout. 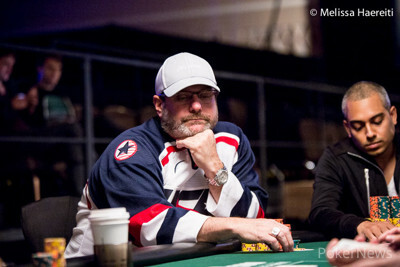 He had raised to 32,000 from middle position and Gregg Merkow pushed all in from the cutoff. Ron Mcmillen got involved when he pushed his shorter stack all in to call, and things got scary for them when Hennigan called with the largest stack, covering them both. The cowboys held and Hennigan scored the double-knockout, sending Merkow and Mcmillen to the cashier and we have our unofficial final table of ten players. We caught the action with the board reading and a bet of 66,000 being made by Mustapha Kanit. His heads-up opponent John Hennigan made the call. The turn was the and Kanit checked. Hennigan bet 114,000 and Kanit called. The river brought checks from both players. Hennigan tabled for two pair, but Kanit had for a higher two pair. Edison Shields found another double-up, but he had fallen short again previously, so he's back up to where he was after his last double. This time Shields got it all in preflop against Gregg Merkow. "I'm in better shape than I thought!" Shields said excitedly. "Look out. I'm running good," replied Merkow. The flop was dangerous for Shields, coming to give Merkow a flush draw. The turn and river did not complete the flush though — coming , then — and Shields was safe. Shields commented on the unfortunate flop. "What are you complaining about? You faded it," said Merkow. Jaime Kaplan opened to 32,000 from early position and Dylan Thomassie called, as did Jacobo Fernandez from the big blind. The flop was and Fernandez checked. Kaplan continued for 62,000, Thomassie made the call, and Fernandez folded. The turn was the and Kaplan checked. Thomassie bet 130,000 and Kaplan called. The river was the and Kaplan checked. Thomassie slid out 250,000 and Kaplan folded, giving the pot to Thomassie. Dylan Thomassie opened to 32,000 from late position and Ted Gillis made the call from the small blind. The flop was and Gillis checked. Thomassie bet 38,000 and Gillis raised to 76,000. Thomassie made the call and the turn was the . Both players checked to see the river . Again both players checked and Gillis rolled over . Thomassie tabled for two pair and won the pot. Edison Shields has made an early double-up after pushing all in from the big blind following Hiren Patel's opening raise from the cutoff. Patel made the call and the race was on. 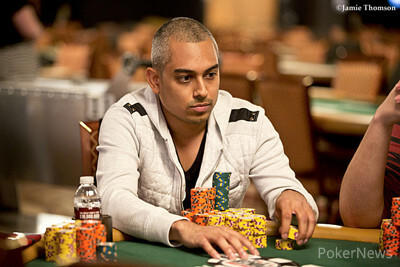 Shields was in need of some chips, and Patel will hardly miss them with the massive stack he still has remaining. On the first hand of Day 3, Mustapha Kanit opened to 32,000 from early position and Ron Mcmillen called from late position. The flop was . Mustapha continued for 32,000 and Mcmillen called. The turn was the and Mustapha bet 81,000 and Mcmillen again called. The river was the . This time Mustapha led for 110,000, and Mcmillen folded. Mustapha showed for the flopped set. Welcome to Day 3 of the latest $1,500 No-Limit Hold'em event. They started Day 2 with 233 players, quickly reaching the money and then whittling down to just 12 remaining after 10 levels of play. 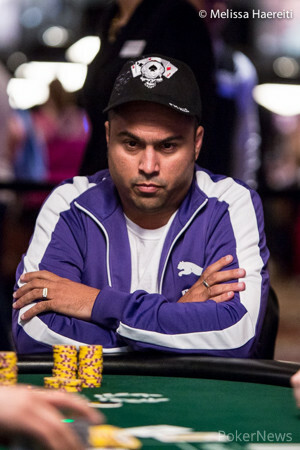 Hiren Patel comes in as the chip leader with an impressive stack of 1,873,000. A few of the notables that made the money but failed to advance to Day 3 included Jason Somerville, Matt Affleck, and Loni Harwood. Phil Collins was also making a quest for his second final table of the summer, but fell short as he was eliminated early in two-table play for a 16th-place finish. Johnny "World" Hennigan, Jacobo Fernandez, and Mustapha Kanit also remain, but all will start at quite a chip disadvantage to Patel. Kanit (1,183,000) and Ted Gillis (1,118,000) are the two other players who are over the million-chip mark and Jaime Kaplan (984,000) is close behind. We are only three eliminations from the final table and 11 eliminations from finding the next WSOP champion. A huge payout of $514,027 awaits today's winner. Play is set to begin at 1 p.m. local time today. Be sure to follow PokerNews as we bring you the action, including hand-for-hand action of the final table.